A dining set can be both practical and decorative. Table and chairs can add flare to a room, or be more subtle and match the ambiance of the décor. 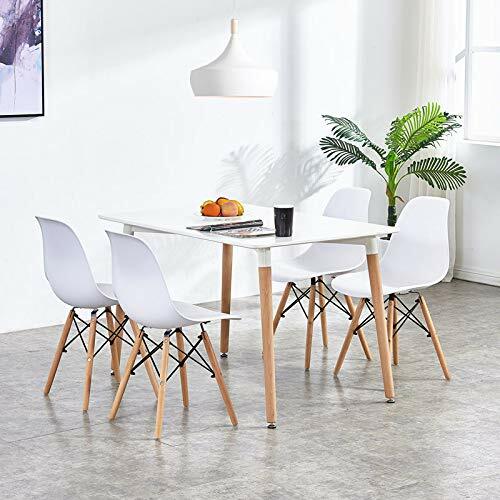 Whatever you need for your space, there is most likely a table and chair dining set waiting for you. 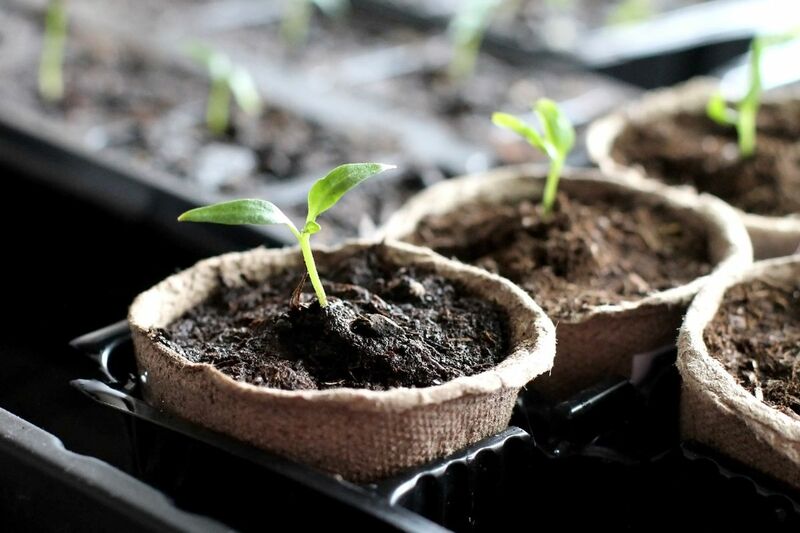 Many of these sets listed below are eco-friendly, making them the perfect investment for your home. 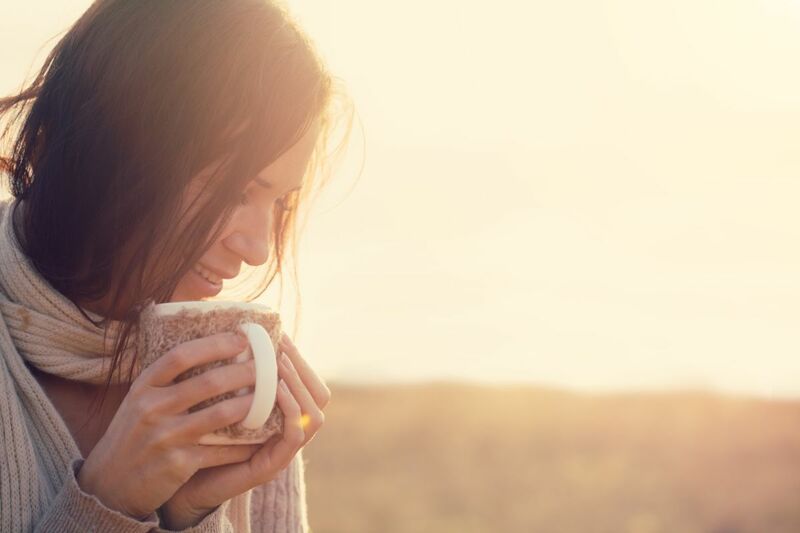 Not only will you be giving yourself the space to eat, work and relax, but you are doing your bit for the environment as well. 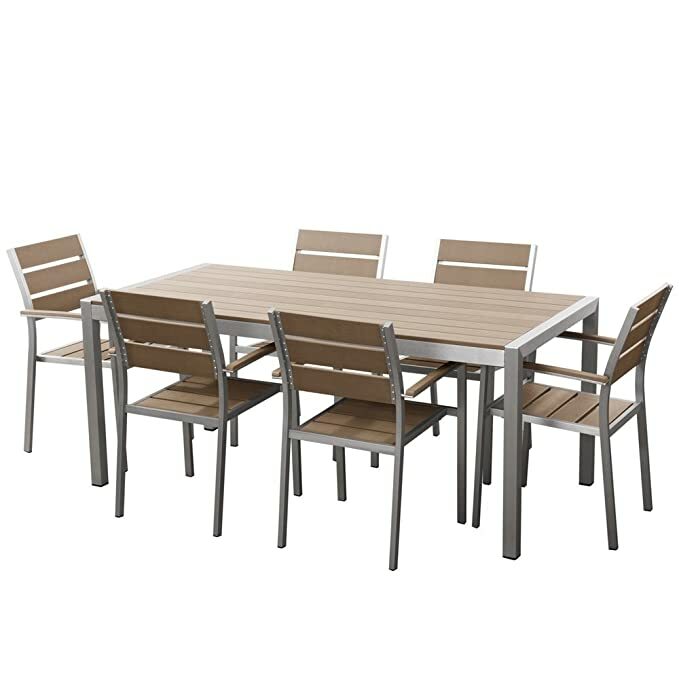 This 7 piece outdoor dining set is low maintenance, but it looks really neat is pretty practical. It is made from durable powder-coated aluminum and synthetic wood. It is 100% resistant to UV rays and harsh weather conditions. The chairs can be stacked on top of each other for easy storage when not in use. The brown color is subtle to fit into most homes, both indoors and outdoors. The synthetic wood and aluminum help the set last longer, meaning you don’t have to replace it with a new set anytime soon. For practicality, it is a great buy. 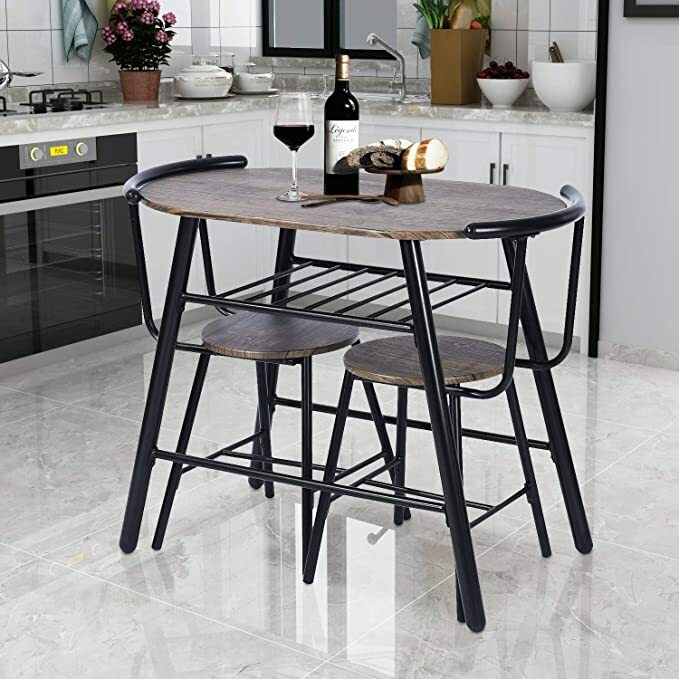 This compact dining set is perfect for smaller spaces or even in the kitchen. It is made from eco-friendly MDF and some heavy duty steel. The top of the table is made from marble veneer, which is both hardy and decorative. The two upholstered chairs fit underneath the table to save space, only to be pulled out when needed. You can still enjoy the dining experience in a small, compact space. The retro colors and designs are still subtle enough to fit into most décor themes and colors. For a multipurpose dining set, this is a decent option. Underneath the spacious table top is a shelf that can hold a variety of things – wine bottles, newspapers or even snacks. The sturdy design of the table also allows for the chairs to fit snugly underneath. The frame is made with industrial grade, eco-friendly MDF which will last for many years. In a kitchen nook or dining room, this set will serve many different purposes. It gives you eating room and some extra storage space as well. While this is made to be an outdoor dining set, it will be a great addition to a dining room as well. It is a larger set, so would suit bigger families or a couple who love to entertain. The seats are stackable, to save space, and the cushioning adds a nice, comfortable touch. The teak finish acacia wood table is a piece that will accent any room. 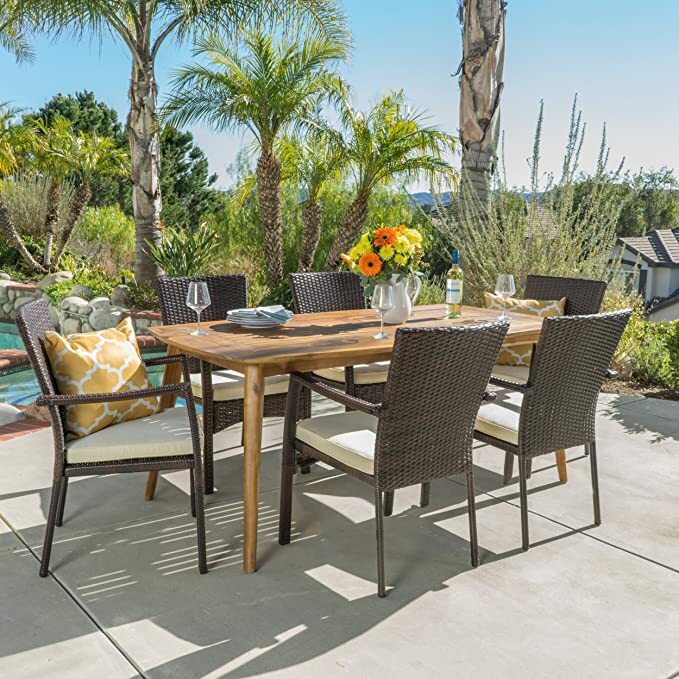 The wood is finished to be resistant to the sun and harsher weather, and the wicker chairs are comfortable and sturdy. 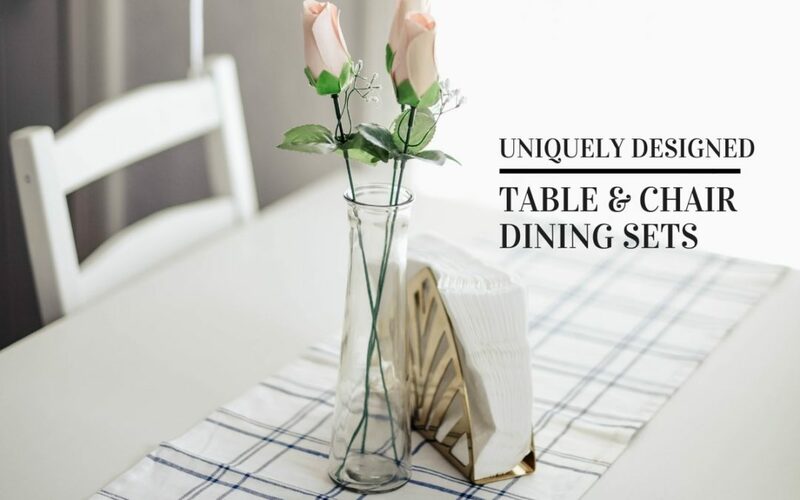 It is a more rustic looking set, but the table does add a touch of style to the dining set. 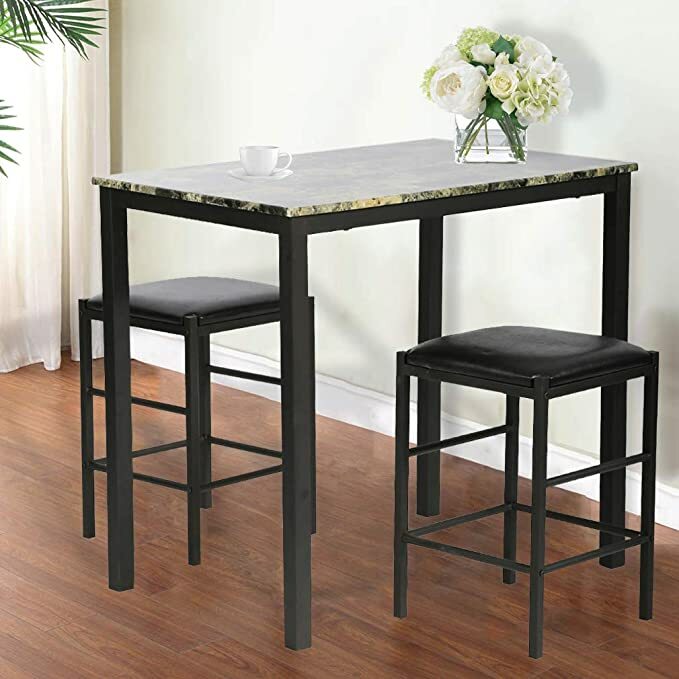 A modern, rustic bistro dining set that fits perfectly into small spaces. 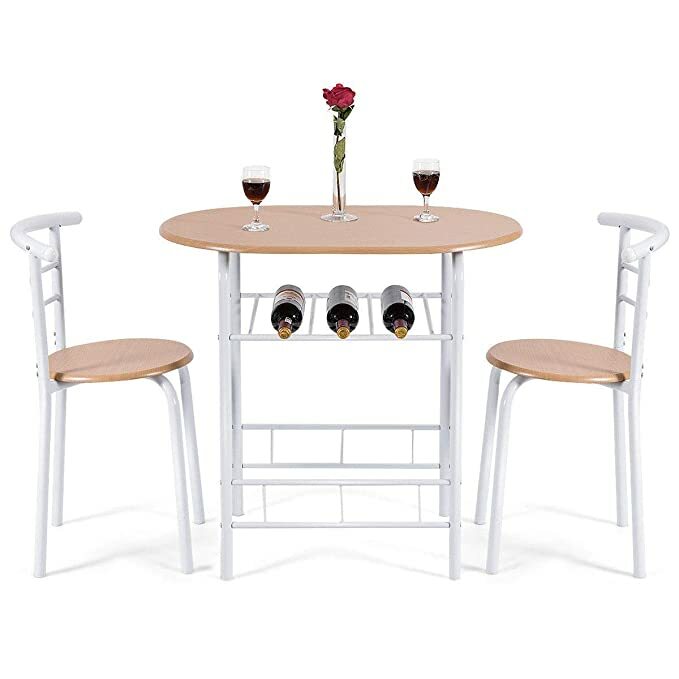 The compact design even comes with an additional shelf under the table top, perfect for storing wine or fruits. The furniture is made from good quality, eco-friendly MDF and premium steel, and the chairs have been ergonomically design with a curved back for extra comfort. The set can be taken from the kitchen to the poolside, it is small and portable enough to serve many different purposes. 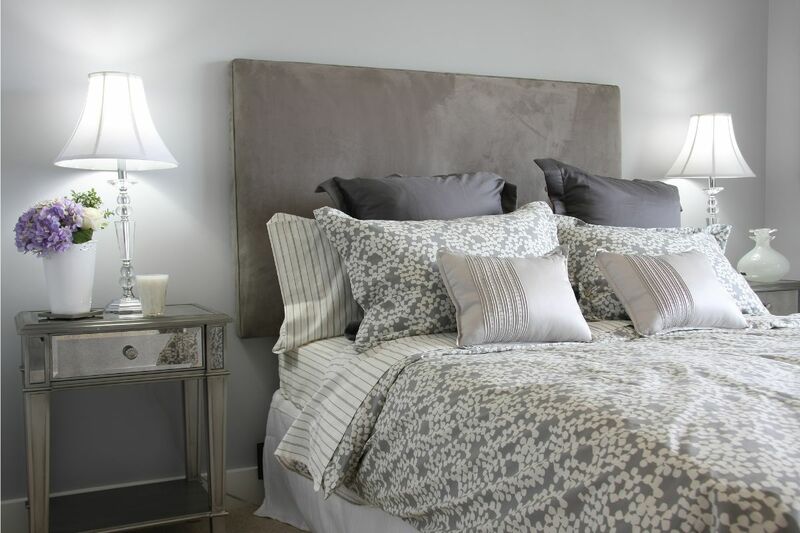 The darker, muted tones will match the design of many homes and kitchens. There is nothing wrong with a bright pop of color, even if it is in the form of a funky little dining set. 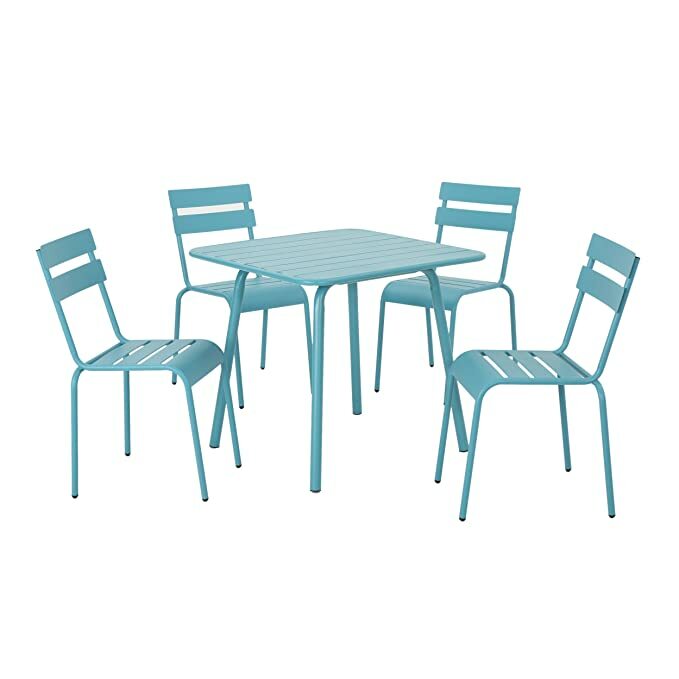 This four chair dining set has a retro design, but it has a simple and casual charm. The functional iron finish makes cleaning up a breeze, and the sturdiness of the chairs means they will last for many years. It is a great accent set to add to a room needing a little bit more color, and it can pack away compactly as well. This elegantly designed dining set is both modern and contemporary. It can be used in both the dining room and living room, having a look that transitions easily between different decors. The non-toxic HQ polypropylene is easy to clean, and the non-scratch plastic foot helps protect your floors from any scratches. The black steel frame is both sturdy and durable, making the set last for a longer period of time. The white and wooden tones are in at the moment, but are also a timeless look. Polywood lumber is resistant to splinters, cracks, peels and rot. It is resistant to different climates and weather conditions, and it is one of the most durable sets around. 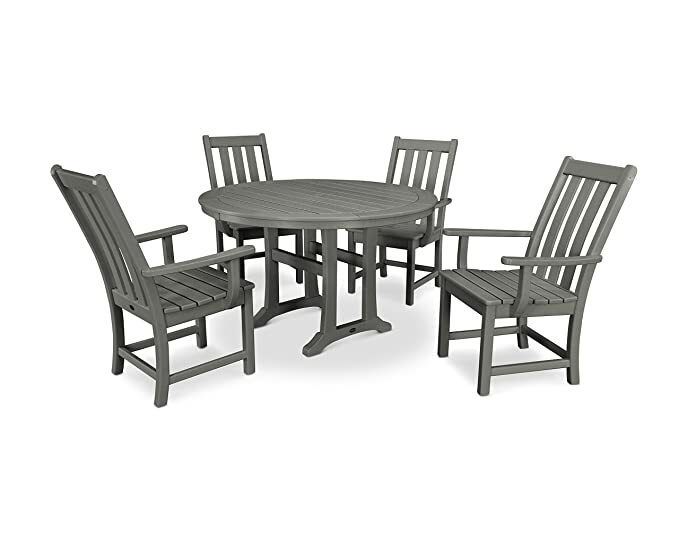 It is perfect to be used on a patio or enclosed verandah, for an outdoor dining experience. The Polywood recycled lumber is very eco-friendly, and adds to this by be being long lasting, you will not have to get rid of the set any time soon. It comes in a variety of colors and can fit into any home perfectly. You might need a compact dining set to fit into your breakfast nook, or you might need a dining set to fit your large family at dinner time. 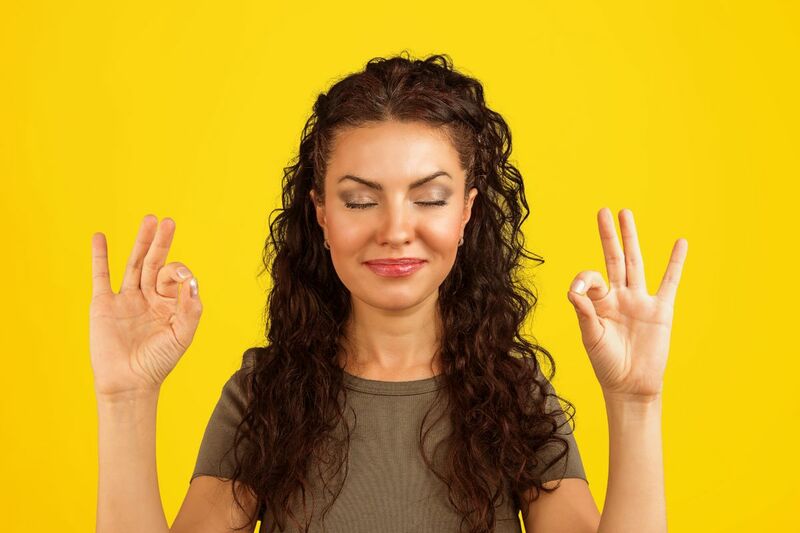 Whatever your needs, there are some great and unique options for you to choose from. Find the one that suits your family perfectly, but one that is also made from eco-friendly materials.